A total of eight police officers got injuries during the clashes amid the Victory Day celebrations in Ukraine, the state's national police said Tuesday. 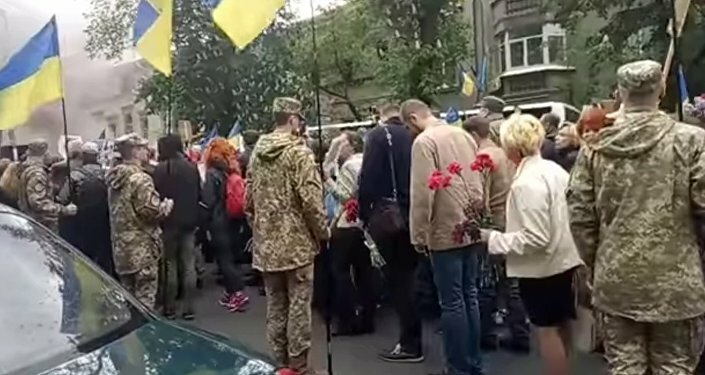 KIEV (Sputnik) – Earlier in the day, Ukraine's Deputy Minister of the Interior Sergiy Yarovyi said two police officers were hurt in the clashes in Ukraine, and noted that participants of the commemoration and celebration events were not injured. "According to the intelligence-gathering services, eight police officers were injured while ensuring the safety of public events participants," the police said in a statement, adding that two people were wounded in the Ukrainian capital and Zaporizhia and six more officers sustained injuries in the city of Dnipro. Yarovyi told a briefing that Ukrainian police detained 45 people across the country for public order disturbances during celebrations on occasion of the Victory Day on Tuesday, 25 people were detained in the capital city of Kiev alone. Ukraine does not house festive events, including military parade and fireworks, aimed at celebrating the 72nd anniversary of the victory over Nazism in WWII. Official events are limited to laying flowers at the Tomb of the Unknown Soldier and receiving oaths from Ukrainian army recruits.